I’ve been in Brazil for the past week for some research coordination meetings. This has involved a number of different folks in several forums, but the whole process was pervaded by a patent anxiety on the part of many people I spoke to with regards to climate change. This is not new of course, but was certainly tinged with renewed shades of urgency because of the lead up to the COP17 meeting in December in South Africa and the RIO+20 meeting next June in Brazil. The latter will celebrate twenty years since the influential Rio earth summit on sustainable development in 1992 and will revisit progress on many of that meeting’s themes in light of what we now know about climate change, its causes and impacts. On this trip I was introduced to Dr. Edmo Campos, an ocean and climate modeler at the University of São Paulo. Edmo and others of his ilk study how the ocean and atmosphere circulate, whether we can make computer models that accurately reflect these circulation patterns and whether those models have useful power to predict future climate patterns or to explore different scenarios that might arise if we go down different climate trajectories. Edmo showed me one especially compelling slide (the animated gif below) and opened my eyes to an oceanographic phenomenon that shows just how connected seemingly distant parts of the global climate system can be. It’s called the Agulhas Leakage and it turns out to be one of the most important drivers of global climate that’s been studied in recent times. To understand what the Agulhas Leakage is (I’ll call it the Leakage from now on) and what it means, it helps to have a bit of background about how the oceans of the world move, because they are not mammoth static lakes, but a complex network of interconnecting currents (Kevin talked about this in his excellent World Oceans Day piece at Scientific American). These are what Edmo and others call “rivers within the sea”, criss-crossing streams in the oceans, connecting them all in a giant energy conveyor that moves water warmed by the tropical sun towards the poles along the surface and mixes salts and nutrients down into deeper waters at higher latitudes. 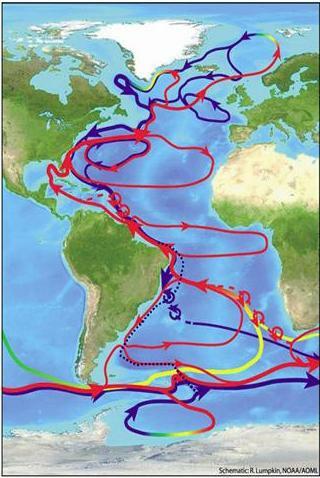 One of the most well-known of these circulation patterns is called AMOC* by oceanographers and includes the Gulf Stream current that is familiar to so many folks who live in North America and Europe. The Gulf Stream is the current that shoots up the Atlantic coast of the US before arcing across towards the UK, bringing Caribbean warm water to the coasts of western Europe and allowing those countries to have more temperate climates than nations at similar latitudes elsewhere. There’s more to AMOC though, including giant rotating gyre currents in both the North and South Atlantic, equatorial currents that jet warm water across the ocean basins and the Brazil current that runs southward along the east coast of South America. Together, the currents that make up AMOC form a really important driver of the climate by redistributing the sun’s energy in the Atlantic, which would otherwise be concentrated between the tropics. Those waters then warm the overlying air at higher latitudes, creating in large part the local and regional climates we know. What I learned from Edmo, however, is that AMOC is not a standalone system but is connected to other oceans, and particularly to the Indian Ocean via the Leakage (the warm path) and to the Southern Ocean by the Malvinas Current (the cold path). Deep in the South Atlantic, the AMOC system butts up against the Great Southern Ocean, which is basically a vast donut of circum-polar cold currents that encircle Antarctica at those southern latitudes where no other land interrupts their ceaseless circumnavigation. This edge is a pretty sharp boundary that keeps the Atlantic system largely isolated, except right at the tips of South America and South Africa. From the Flakland Islands, the Malvinas current branches off the circumpolar current and runs up the coast of Patagonia, donating cold water to the AMOC system: the cold path. Over in South Africa on the other hand, the much warmer and saltier waters of the Indian Ocean run down the east coast in the form of the Agulhas current. Normally they would make a hard left at the Cape of Good Hope and head back east towards Western Australia. Consistently though, parts of the current curl around the Cape of Good Hope, spinning off eddies to the west. These giant rotating whirlpools of warm Indian Ocean water then dance off into the South Atlantic, like curls of smoke off the tip of a long held cigarette, until they become entrained in the northward flow in the South Atlantic branch of AMOC: the warm path. It is these eddies and this water that constitutes the Agulhas Leakage and connects the Atlantic and Indian Oceans. Edmo was inspired by the data captured by the figure above and by two studies Biastoch et al that showed that the Leakage and the resulting warm path are a very important contributor to the entire Atlantic system because those eddies hang together pretty well and they also bring with them a great deal of energy because they are so much warmer than the Atlantic water. The computer models that these oceanographers developed showed that the energy from the warm path even finds its way into the North Atlantic, only starting to lose juice once you get into the higher northern latitudes, where the influence of the adjacent polar waters take over. You can see this in the animation, where the cold (blue) Malvinas current in the lower left is rapidly overwhelmed by the warm (red) Agulhas-derived water coming across from the east. Edmo and his colleagues took things one step further and looked at how these ocean circulation models affected atmospheric climate models. In other words, how do warm eddies propagating from South Africa affect the long-term weather outlook in Europe and North and South America? To do this they looked at what would happen if you plugged the Leakage, effectively switching off the warm path from the Indian into the Atlantic, and their results were surprising. One effect was that the leakage of warm water into the south Atlantic currents was replaced by more of the cold water leaking in from the Southern Ocean via the Malvinas current. This stronger influence of the cold path had a profound effect on the outcomes of the climate model, including a shift in where the trade winds occur and possible drought (“negative precipitation anomalies”, love that jargon!) in the tropical South Atlantic (Brazil and West Africa). This is especially important as Brazil has already been proposed to suffer from a dryer climate as a result of continued global warming trends. Importantly, the influence of the switch from warm path to cold path that results from switching off the Leakage did not stop at the equator but propagated in their model all the way into the North Atlantic, potentially affecting the climates of North America and Europe. As a result of the recent work on the role of the Leakage in the AMOC system, the influence of these powerful eddies will now have to be considered in models of global ocean and atmosphere circulation. It shows how important something as seemingly quiet and inconspicuous as an ocean current can be, and just how connected water and air are everywhere in shaping the world’s climate. You could be sitting right on top of a warm eddy and you would never realize it, yet they are a critical piece of the global climate system. As we approach COP17/Rio+20 and continue to struggle with the nature and impacts of climate change, an increase in our understanding of the roles of these and all ocean currents in global climate can only help shape better solutions. Share the post "The Indian Ocean’s cup runeth over"